While law enforcement officials are still struggling to figure out how to use UAVs (aka drones), those outside of law enforcement are breaking new ground. 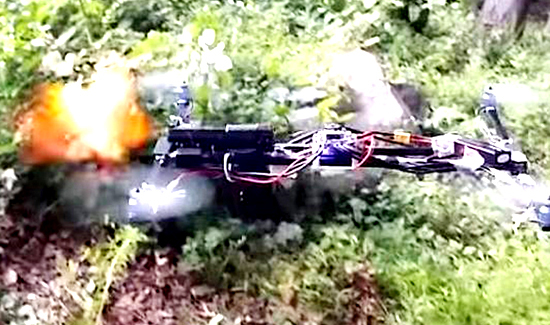 For instance, a Connecticut teen recently became an overnight sensation after he successfully weaponized his commercially available drone with a handgun. Austin Haughwout, 18, posted a clip online showing the drone firing four shots, which triggered a police investigation. Surely there must be some rules about this kind of thing, right? Certainly in “post-9/11 America” people can’t lawfully weaponize drones and send them out willy nilly. Police in the kid’s hometown of Clinton say they can’t find anything to charge him with. One law enforcement expert believes the only hope of filing a charge in these cases would be reckless conduct. And that’s a long shot. Haughwout’s father told NBC Connecticut that the gun belongs to him and said his son did “extensive research” to ensure it didn’t break any laws. The reference to the length may be an attempt to comply with federal law governing overall length of rifles. The FAA is now involved but it’s unclear if this will be perceived as a big government crackdown on individual liberty—which could gum up the works as far as filing charges. The critical part is obviously the fact that those who hold grudges against police—such as the recent Dallas Police Headquarters shooter—don’t have to worry about risking their lives by engaging officers in gun battles. They can do it by remote control. And right now there’s nothing on the books that would prevent a Dylan Roof (Charleston) or a Mohamad Youssef Abdulazee (Chattanooga) from preparing extensively for an attack using commercially available drones and firearms.